The plant of the month is Hibbertia Scandens, a member of the large genus Hibbertia. This genus is endemic to Australia and there is considerable variety among the 130 or so species. The common name is Guinea Flower, as the round, yellow flowers resemble the ancient golden guinea coin. They range from tall shrubs to trailing vines. Hibbertias tolerate a wide range of environments, but occur mostly in temperate areas in heath and woodlands and in open forest. They grow in many soil types, and though some can grow in wet areas, most prefer soil that is well drained. 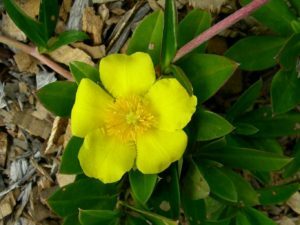 Hibbertia scandens (Climbing Guinea Flower) is a vigorous, trailing or climbing plant that grows well in coastal areas as it tolerates salt winds and sandy soil, will grow in full sun or part shade and requires little maintenance once established. Flowering is in late spring to summer and although the flowers are short lived, the plant continues to produce new flowers for some time. Red seeds are released from a capsule. It is a good ground cover, but it may stray up into trees, so this needs to be watched. The positive aspect of this is that it can easily be trained to cover fences and trellises.